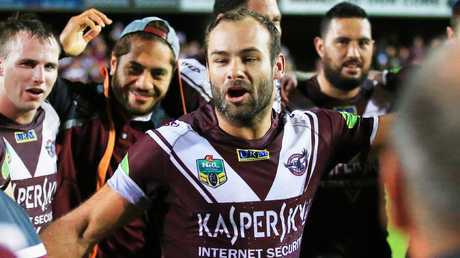 Brett Stewart will give Brendan Elliot some old school know-how. TALK about a college of knowledge. 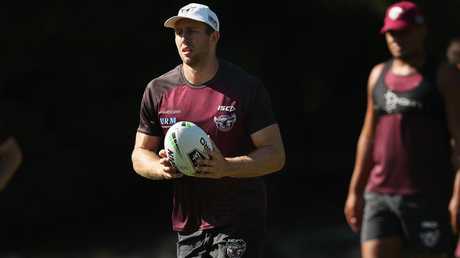 He may have been thrown in at the deep end but new Sea Eagles fullback Brendan Elliot has two of Manly's greatest No.1s to prepare him for Saturday night's NRL opener against the Wests Tigers. Elliot has played just seven of his 40 NRL games at fullback and faces a tough task filling the sizeable shoes of injured custodian Tom Trbojevic. 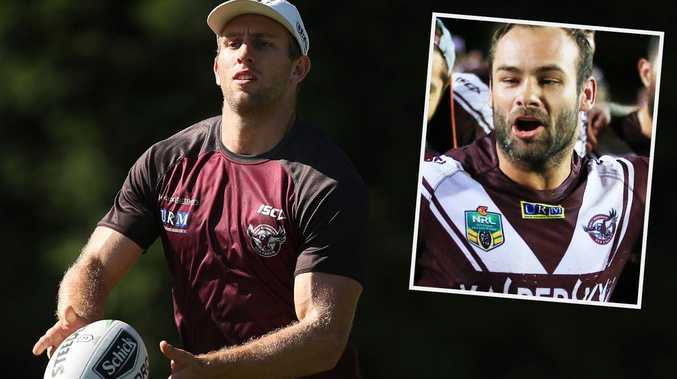 Although he has only won one career match at fullback, Elliot has the backing and tutelage of Trbojevic and legendary Manly No.1 Brett Stewart. A full off-season training program at fullback, alongside Trbojevic, has Elliot settled and confident entering the Leichhardt Oval match. Elliot also knows a bold showing would have him ready to slot back into fullback when Trbojevic is absent mid-season on State of Origin duty. "They are massive shoes to fill. Tom is a champion player. I have been training there with Tom from day one of pre-season and he has given me a lot of tips and pointers," Elliot said. "We have spoken about positional stuff - offensive and defensive - and about confidence as well. He has said to back myself and things will fall into place. "Tom is the first-choice fullback. I just want to do my best for the team this weekend and put my best foot forward, do a solid job for the team." Elliot is likely to keep the No.1 jersey next week as well with Trbojevic not expected back from a hamstring injury until at least round three. Stewart, the Prince of Brookvale, has joined Manly's coaching staff to help guide the back five. "Snake (Stewart) is a legend of the game," Elliot said. "As with Turbo, he just gives you confidence and tells me to back my ability and to be vocal and loud on the field. "In defence, he tells me that I should demand where the boys should be on the park. "He pops in and really helps out a lot. To get some great wisdom from him, you can't buy that sort of thing. I am feeling pretty confident and am ready to go this weekend. I'm feeling good." In his stints with the Sydney Roosters, Newcastle and Gold Coast, Elliot has predominantly played as an outside back, but is relishing the chance to anchor Manly's back five. "One of the strengths of my game is that I can play wing, centre and fullback. That was actually one of the things Des (Hasler) said to me earlier in the preseason - he wants me to learn fullback because Tom will be out with rep duty," he said. "He wanted me to nail the fullback role. It just so happens that Tom has been unfortunately injured and I will slot in there. There are also no hesitations about me playing centre or wing either." Manly named Kane Elgey at five-eighth with rising star Reuben Garrick chosen on the wing. Trent Hodkinson will come off the bench. Manly forward Corey Waddell was a late withdrawal. An ultrasound found Waddell had sustained a broken rib and won't play for between four to six weeks. Elliot paid tribute to Hasler, saying: "He is a great coach, definitely the most experienced coach I have had and that really shows. He has a very serious outlook on training and I think that's what we need. "We have been training really hard over the pre-season and that will put us in a good position for the season ahead. "I spoke to a few of the boys prior to coming here and they said what a good club it was. Being back in Sydney was a major part of it. I love living in Sydney and enjoying the lifestyle. I got a two-year contract, which was enticing as well. I feel very comfortable in Sydney." Elliot claimed it would be "exciting" working on the inside of Manly skipper and halfback, Daly Cherry-Evans.